So what makes this exhibit more than a live version of a Buzzfeed list of 50 Tasty Paintings You Have to See? The theory is that how we depict food is a reflection of who we are—or, more likely, who we want others to think we are. Food, like other appetites, always has a moral dimension, and the exhibit can be read for what it says about the people who created these works . . . at least for a while. The next several galleries cover the 19th century, and here the theme of food painting as a window into attitudes makes sense, as when Raphaelle Peale (son of Charles Willson Peale) paints fruit and vegetable still lives that have the virtue and probity of New England bankers. But meat and drink soon find their way into the images, crystal wine decanters and voluptuous red flesh hinting at other pleasures. As painted by Emanuel Gottlieb Leutze, the bounty of a hunt—species piled on species, corpse upon corpse—looks like the results of a fit of God's wrath on the animal kingdom. The Gilded Age, which had the money for decadence in abundance (any reader of Lucuis Beebe's The Big Spenders will recall images like the banquet held on horseback), reaches the apotheosis of using still lifes to polish your self-image. Spare images of pristine fish or produce could have come from any farm-to-table restaurant today, serving those whose piousness about what they eat excuses the ostentation of how much they're spending. 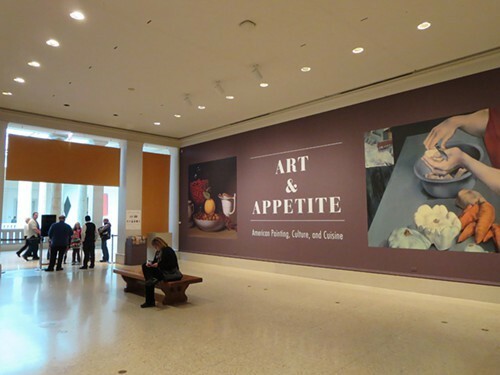 But maybe because food is so common and domesticated, seriousness doesn't last long; this part of the exhibition demonstrates that the wink in Rockwell's paintings goes back long before him, as in a crowd-pleaser of a room devoted to trompe l'oeil. For me the discovery of the exhibition is a woman painter named Lilly Martin Spencer, whose domestic scenes take the outlook of Dutch painting and add a little Jane Austen wit, as in Kiss Me and You'll Kiss the 'Lasses from 1856, which would be a dour scene of scullery work but for the flirtatious look in the woman's eye. Restaurants and bars become a subject matter toward the end of the 19th century, as American painters imitate those hard-drinking impressionists, but it's here that the exhibition seems to lose its way. It's mildly interesting to see, say, a Stuart Davis or Gerald Murphy take on a still life, but the fact is that restaurants and then the commercial food industry put so much effort into creating and selling their own images that it winds up seeming like artists played catch-up for most of the 20th century. Edward Hopper beat the diner into submission (Nighthawks has been moved over here for the duration), but few others did as well. Only when pop artists started using advertising's own imagery against it did they seem to have something big enough to say. 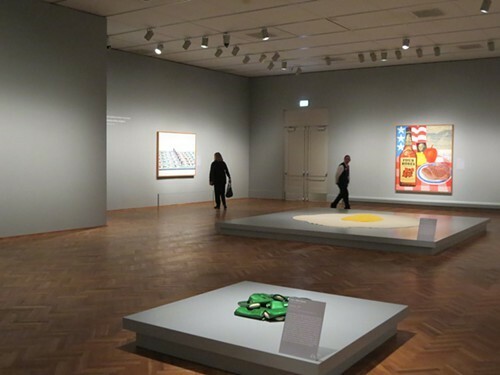 As a result, the last gallery offers a very few works separated by a great deal of space, which hardly meshes with the ubiquity of food imagery in our lives. (And it doesn't help when they're as familiar as Wayne Thiebaud's painting of cakes and pies, a great modern work, but about as overexposed as the Mona Lisa by now.) There are a very few examples of commercial art—a Chez Panisse menu that, oddly, doesn't appear to be by David Lance Goines, who did so much for that seminal restaurant—but there should have been lots more, Googie menu covers and surreally colorful advertisements and so on, establishing the noisy context for the pop-art works here. And showing us why we still need painters, when any of us can make food art with a pocket camera or iPhone anytime we go out to eat.